SEATTLE - Image after image provided to Seattle's KIRO-TV reveal what three baristas claim they dispose of nearly every day while on the job at Starbucks: hypodermic needles they say were left behind by drug users. All three employees also produced hospital, pharmacy and insurance receipts that show they took anti-viral medications to protect them from AIDS and hepatitis – after all three were poked by needles while on the job. "(Needle users) put them in the tampon disposal boxes in the bathrooms, and we have to dig them out,” one barista recently said. The three baristas all spoke with KIRO. Only one was willing to be interviewed on camera, as long as her identity was hidden. “I don’t want to lose my job for being the only one willing to say, 'Someone listen to me. Do something about this. My friends are at risk,'" she said. 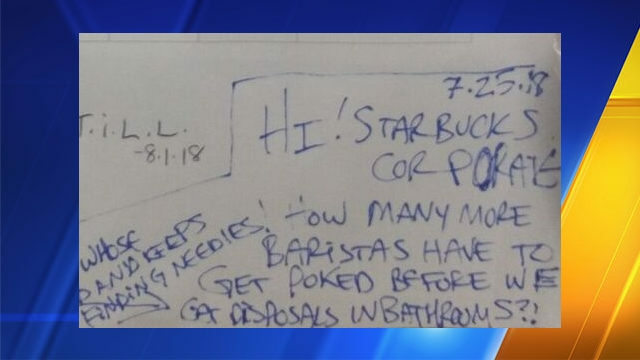 At the employees' north Seattle-area Starbucks, co-workers document when needles are found, leaving notes asking, "How many more baristas have to get poked before we get disposals in bathrooms?" 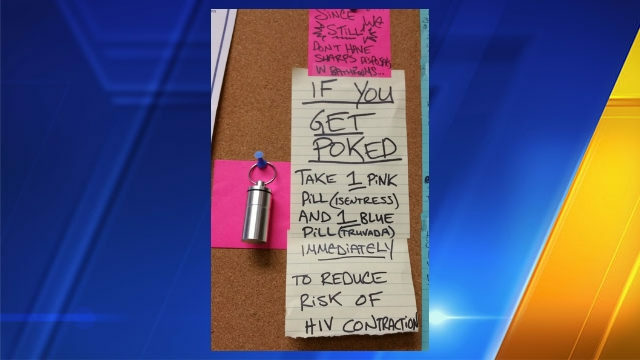 For a while, they even shared medication to avoid illness if pricked because in the past 12 months, three baristas have been, according to medical documents provided to KIRO. That practice was abandoned as soon as the employees learned sharing medication could get their manager in trouble. “That’s three of us now, in one location,” the barista who spoke on camera said. She and the two other baristas would like Starbucks to install locked needle disposal boxes in all restrooms, especially in cafes, where drug use is more common. “I’m pretty sure it looks worse to have your baristas continuously exposed to HIV and hep C and hep B” than to have locked boxes for needle disposal in areas open to the public, the barista said. 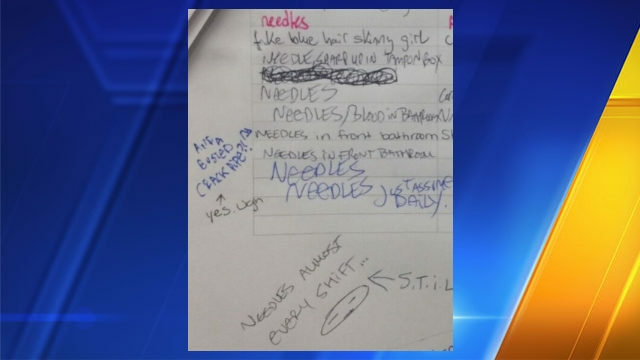 Starbucks spokesman Reggie Borges confirmed to KIRO that at least two Seattle-area baristas have been poked by hypodermic needles while on the job, but Borges claims that since early 2017, all employees have been retrained on what steps to take when hypodermic needles are found. He also disputed baristas’ claims they must “dig” needles out of trash bins. If an employee is "ever in a position where they don't feel comfortable completing a task, they are empowered to remove themselves from the situation and alert a manager," according to Borges, who would not agree to an on-camera interview. KIRO confirmed that Starbucks made the training changes after a 2016 investigation by the Washington State Department of Labor and Industries fined the company and determined it was not ensuring "that regulated waste, such as contaminated hypodermic syringes, are handled properly and safely” at Starbucks’ 6th and Pine location in downtown Seattle. There are “requirements for employers to make sure they’re protecting their employees and not let this happen to them, if at all possible,” according to L&I spokesperson Tim Church. Safe needle disposal is certainly not just a challenge for Starbucks. With intravenous drug use on the rise, locked needle disposal boxes are widely sold online. Many Seattle parks now have them to protect parkgoers. The Chaco Canyon Organic Cafe, in Seattle, installed locked needle disposal boxes in its restrooms earlier this year to provide a safe disposal option for sharps. Employee Jeff Coyne told KIRO in February that the locked boxes “encourage the safe practice of disposing” of needles. However, L&I’s Church admits, even when the public has access to locked needle boxes inside bathrooms, employee safety is not guaranteed. Such boxes “deal with some of the issue, but I don’t think they deal with the entire issue,” Church told KIRO. “You’re still going to have a certain number of folks who are going to take that needle and throw it in the trash, so you can’t take a sharps box and assume the problem has been solved and not teach your employees to handle garbage safely,” Church said. According to Borges, all Starbucks cafes already have sharps boxes in employee-only areas so baristas can safely dispose of any needles using gloves and tongs. After KIRO started asking questions about the three baristas poked while on the job this past year, Borges confirmed there have been "ongoing conversations about adding additional protections and procedures to further ensure the safety" of employees, including "exploring installing sharps boxes in the bathrooms of our stores where it would help address the issue." That development is welcome news to the baristas KIRO interviewed, who all said the needle problem has grown since Starbucks opened its restrooms to everyone – even nonpaying customers – this past May. “Because you don’t have to bother with purchasing anything, needles have definitely increased,” one said. In response, Borges told KIRO that Starbucks’ Third Place Policy – which opened its restrooms to all – still has rules that must be followed. The baristas, however, claim it’s difficult to enforce those rules behind a locked door. Photo illustration of a person injecting drugs.